Sitting here listening to the roaring downpour and the powerful percussion of the waves outside, it’s hard to imagine the winter days we left behind just a few weeks ago. That world, life on another continent, seems strangely within touching distance and yet unreal, like a hazy dream. There, when the dark chill hushed the streets, we sought cheer in front of the fireplace, playing board games, catching up on movies and eating hearty, winter-warming meals. At the end of a cold day, we looked forward to the comforting embrace of those family dinners. 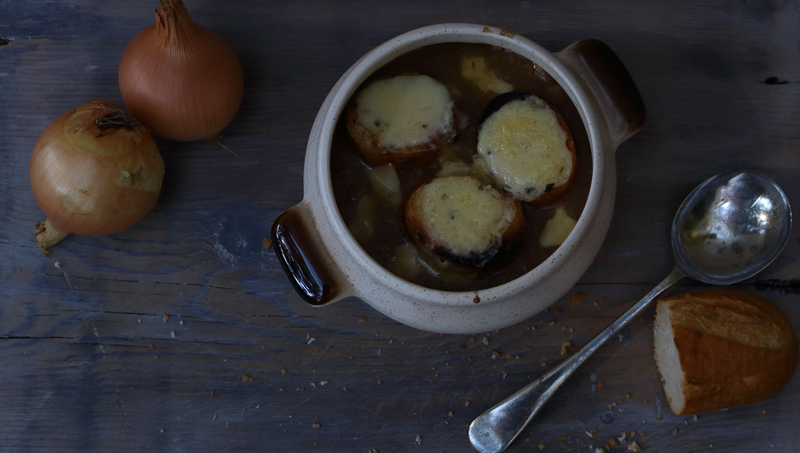 And what better than classic, old fashioned French onion soup to infuse our tired bodies with gentle warmth, like a mother’s hug. French onion soup as we know it, found its way from working class inns where it filled the bellies of labourers, offering much-needed protection against the bitter cold, to the chateaus and courts of the bourgeoisie, where it was elevated with meatier broths and creamy cheeses. Over centuries, it became a symbol of the finest traditions of French cooking. To me, it’s slow food at its best – simple ingredients that are patiently coaxed to produce deep, soul-satisfying flavour. Traditional recipes favour beef broth for richness and depth of colour but chicken or vegetable stock would work well to make a slightly lighter, modern version. The caramelised onions can be counted on to lend the toffee tones to the soup. Sweet Spanish or varieties of white onions are what you need. Pungent red ones,in my opinion may not yield the same gentle flavour; although I haven’t tried them. We’ve all seen pictures of the golden, cheese-topped toast crowning a bowl of French onion soup. To get that perfect look, wait till minutes before serving to put on toasted slices of a day- old crusty baguette. Be generous with the cheese – all the better to get a rustic bubble and splatter when you run it under the broiler. Serve it piping hot with the molten cheese running into the soup or over the rim of your bowl. A rustic French classic, rich, brown soup topped with melting Gruyere on a golden toasted baguette. In a heavy, deep pot or Dutch oven, gently heat the butter and olive oil and add the onions, garlic and salt. Keeping the heat on the lowest level cook these for 40 minutes to an hour, till they gradually turn the colour of dark caramel. Do NOT cook on high heat as this will burn the onions and turn them bitter. Once the onions have reached the desired colour and softness, add the flour and stir for a minute. Now pour in a quarter of the wine (the heat must still be low) and stir so that it combines the onions, flour and the sticky fried bits into one mixture. Cook for 2 minutes for the sharpness of the alcohol to go and then pour in the stock and the remaining wine. Check the salt, add pepper and more salt if required, and with the lid partially open, simmer the soup very gently for half an hour. Just before serving, slice the baguette into thick slices - 1 slice per bowl if it’s a wide loaf or 2-3 slices if it’s narrow. The idea is for the bread to cover most of the surface area of the bowl. Switch on the broiler in your oven and place a baking sheet under it. Toast the bread under the broiler. Now, working quickly, divide the shredded meat (if using) at the bottom of the soup bowls and drizzle lightly with brandy. 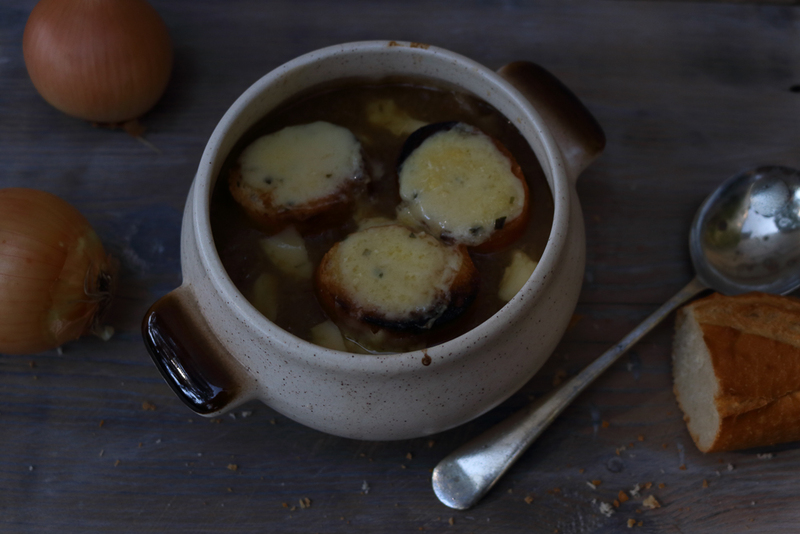 Ladle the soup into the bowls till almost full, top with the toasted bread and sprinkle generously with cheese. Place the bowl on the baking sheet under the broiler till the cheese is molten, golden and bubbling. Serve immediately.